The Alpinestars Yokohama Drystar Jacket brings a unique set of features to the table. So unique, in fact, that it is one of only two jackets with its unique feature set. 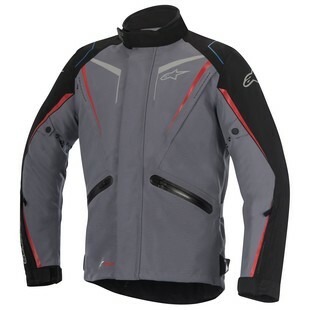 As a 3 season cold jacket for the sport touring market, the Alpinestars Yokohama Drystar Jacket can also be thought as a cross over to the sport commuter who rides year round, in all sorts of weather. Direct body venting, a laminated chassis, and a long sleeve thermal liner all combine to make the Alpinestars Yokohama Drystar Jacket one of the most versatile releases of the year. Two chest and arm intakes ensure ample flow of air through the jacket and dual exhaust vents help to pull hot air out. Rather than using a traditional waterproof membrane, Alpinestars has chosen to utilize a laminated shell which provides guaranteed protection from the elements as well as additional abrasion resistance. Finally, the long sleeve thermal liner includes a mesh collar for added comfort and usability. Coming in at under the $350 mark, Alpinestars has brought to market one of the best, non-Goretex, waterproof jackets in its segment. The Alpinestars Yokohama Drystar Jacket represents what we have come to love about Alpinestars. They have chosen to take a different approach to an already crowded segment and by offering a great jacket with unique features at an accessible price point.